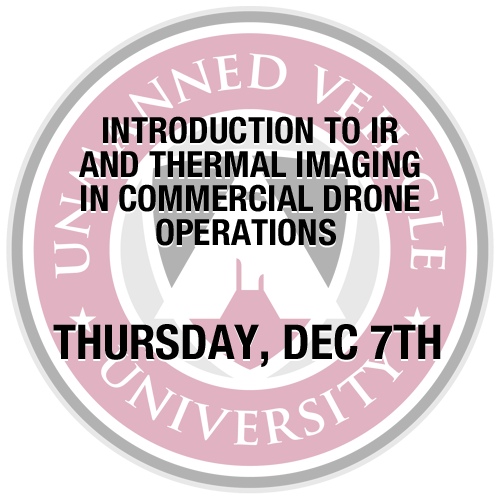 This course is designed for drone users who need to understand the fundamentals of thermal IR cameras and the principles of IR thermography. The course covers the fundamental physical principles of how IR cameras work and focuses on how thermography is used in a variety of commercial and public/safety applications where drones can accomplish the task easier, safer and more economically than previously used methods. Attendees learn how to “read” and interpret IR images and data. Piloting a drone using a thermal IR camera during the day, in civil twilight and at night is a special skill which requires advanced training. In addition to 5 hours of classroom academics, the course provides attendees with a 3-hour real-world ight demonstration on using an IR camera in various scenarios.